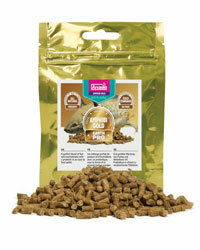 Arcadia Earth Pro Amphibi Gold is a pelleted diet for amphibians. The pellets can be fed on land or in water which helps to stimulate natural feeding behaviours. Especially good for feeding Axolotls, Clawed frogs, Newts and Salamanders. All pellets fed should be consumed in one day, either put pellets into the water or sprinkle on land.